A new study in The American Journal of Pathology reports that mice fed a Western diet, which is high in fat and sugar, resulted in hepatic inflammation, especially in males. Moreover, liver inflammation was most pronounced in Western diet–fed male mice that also lacked farnesoid x receptor (FXR), a bile acid receptor. Other published data have already shown that FXR-deficient mice spontaneously develop steatohepatitis and liver tumors even when they are fed a normal rodent diet. In this study, wild-type and FXR-deficient mice were fed either a Western diet or a matching control diet for 10 months. They found similarities between Western diet intake and FXR deficiency. For instance, both Western diet–fed wild-type mice and control diet–fed FXR KO mice developed steatosis, which also was more severe in males than females. 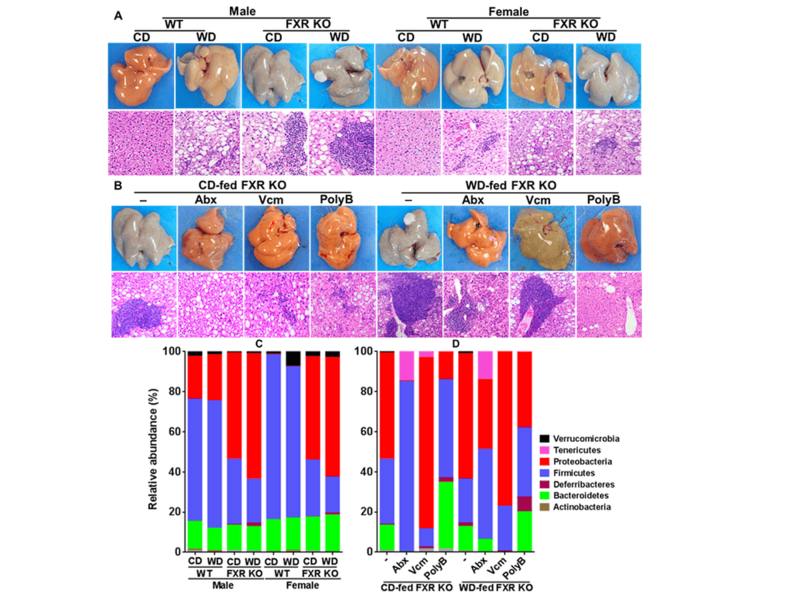 Interestingly, however, only the FXR-deficient male mice had massive lymphocyte and neutrophil infiltration in the liver, and only Western diet–fed male FXR KO mice had fatty adenomas. Depending on what type of diet was provided, broad-spectrum antibiotics, which eliminated most gut bacteria, affected hepatic inflammation differently in FXR-deficient mice. In control diet–fed mice, a cocktail of ampicillin, neomycin, metronidazole, and vancomycin completely blocked hepatic neutrophil and lymphocyte infiltration. However, this cocktail of antibiotics (Abx) was not able to eliminate hepatic inflammation in Western diet–fed FXR KO mice. Additional analysis showed that many inflammatory genes had higher expression levels in Western diet than control diet–fed FXR KO mice after Abx treatment. Analyzing the composition of the gut microbiota, investigators found that Proteobacteria and Bacteroidetes persisted after the broad-spectrum antibiotic treatment in the Western diet–fed FXR KO mice. In contrast, Gram-negative coverage antibiotic, i.e., polymyxin B, increased Firmicutes and decreased Proteobacteria as well as hepatic inflammation in Western diet–fed FXR KO male mice. They suggest that the adverse effects of Western diet on the liver may be explained in part by the persistence of pro-inflammatory Proteobacteria as well as the reduction of anti-inflammatory Firmicutesin the gut. The article is “Western Diet–Induced Dysbiosis in Farnesoid X Receptor Knockout Mice Causes Persistent Hepatic Inflammation after Antibiotic Treatment,” by Prasant K. Jena, Lili Sheng, Hui-Xin Liu, Karen M. Kalanetra, Annie Mirsoian, William J. Murphy, Samuel W. French, Viswanathan V. Krishnan, David A. Mills, and Yu-Jui Yvonne Wan (http://dx.doi.org/10.1016/j.ajpath.2017.04.019). It will appear in The American Journal of Pathology, volume 187, issue 8 (August 2017) published by Elsevier. Full text of this study is available to credentialed journalists upon request; contact Eileen Leahy at +1 732-238-3628 or ajpmedia@elsevier.com. Journalists wishing to interview the authors should contact Yu-Jui Yvonne Wan at +1-916-734-4293 or yjywan@ucdavis.edu. This research was supported by National Institutes of Health, Grant U01CA179582 (Y.J.W. as the lead PI and D.A.M. as the Co-PI).